Since the discovery of the Winchester manuscript (BL Add 59678) of Malorys Le Morte Darthur in 1934, its text and relationship to Caxtons printed edition of 1485 have been the subject of scholarly debate. Neither witness derives from the other and both are removed from Malorys original holograph. 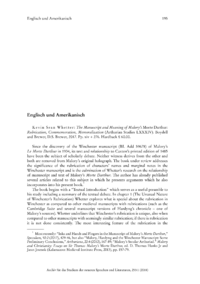 The book under review addresses the significance of the rubrication of characters names and marginal notes in the Winchester manuscript and is the culmination of Whetters research on the relationship of manuscript and text of Malorys Morte Darthur. The author has already published several articles related to this subject in which he presents arguments which he also incorporates into his present book.